In recent years, healthcare audits have been a trending topic within the compliance world. Following the Phase II launch of the HHS Office for Civil Rights (OCR) Audit Protocol in March 2016, many members of the healthcare community equate audits with either the federal government or other large accounting firms such as Figliozzi & Company. All too often, providers assume that due to their size, they can fly under the radar. After all, why would OCR audit a single physician practice?!? Unfortunately, as one of our clients recently learned, it is not just the federal government that is checking on gaps in compliance or incentive program participation, state departments are getting in on the action too. Earlier in the summer, one of our clients reached out as that they had received a letter from Connecticut’s Department of Social Services. The letter explained that due to ongoing program monitoring efforts, Connecticut’s Department of Social Services would be conducting a review of Connecticut Medicaid Electronic Health Record (EHR) Incentive Program payments made to participating providers. Per the notice, federal regulations governing the Medicaid EHR Incentive Program requires States to conduct post-payment reviews. Much to the shock of our client, they were informed they had been selected for a Program Year 2014 desk review and they had just five business days to submit the requested documentation in a PHI secure manner. Naturally, receiving such a letter would invoke a certain amount of panic in anyone, especially when considering the Program Year in question was FOUR years ago. As you can imagine, a trail of fears and concerns ran through their minds: “Did we conduct a risk analysis that year?” “What if we are unable to produce all the documentation required for this audit?” “How do we best respond?” To protect our client’s privacy, we will not share the results of the audit, however, all providers should heed this cautionary tale if they have ever participated in past or current government incentive programs. So, what’s the takeaway from this story? Regardless of whether you performed risk analyses every year for the past six years (per HIPAA Citation 45 CFR 164.316(b)(2)(i)) or not, it is never too late to get your house in order. Auditing bodies respond much better to providers who have performed a risk analysis at least once rather than never. The majority of settlements and fines site either failure to have completed a risk analysis OR failure to take action on high-risk findings. At HIPAA One, we are deeply experienced at responding to a vast array of industry audits and resolutions (now we can add State Department audits to that long list!) and frequently step in to hold our clients’ hands through the experience. One of the benefits of being a HIPAA One client is the assurance that we will stand by any HIPAA risk analysis performed using our software so your organization is not shouldering that burden alone. Contact Us today to learn more. A new study conducted by the Ponemon Institute on behalf of IBM Security confirmed the fears of so many healthcare information security professionals, no other personal information yields a higher value than compromised patient records. Across the country, healthcare organizations have a Goliath size security problem. For an eight-straight year, healthcare has the highest breach-related costs of any industry at $408 per lost or stolen record, nearly three times the cross-industry average of $148. Without a commitment to cyber-security, healthcare entities and their valuable databases containing vast amounts of electronic patient health information (ePHI) are sitting ducks for hackers. We all know that data breaches can cost organizations millions in lost business, reputation management, recovery remediation and year over year that number is exponentially rising. In 2018, the average cost of a data breach globally is roughly $3.86 million, up 10% from 2014. The Ponemon study, 2018 Cost of a Data Breach, is an extensive compilation of data based on interviews with 500 organizations that experienced data breaches. Along with providing staggering breach stats, the study also referenced a new category of breaches, mega data breaches which refers to the theft or exposure of more than 1 million records. The number of mega data breaches has more than doubled in the past five years from 9 in 2013 to 16 in 2017. As you can imagine, these mega breaches are both extremely costly to resolve and can take up a year to detect and contain. The average cost of a mega data breach involving a “modest” 1 million records is hovering around $40 million. So, What’s a Provider To Do?! The findings from this year’s breach report beg the question, how can healthcare providers across the board strengthen their individual security programs and better protect ePHI? For starters, conduct a bona fide HIPAA Security Risk Analysis (SRA.) If your organization has not completed an SRA in the past calendar year, your data is vulnerable, plain and simple. An SRA does more than just help your office collect the largest amount of MIPS/MACRA reimbursement dollars, by identifying gaps in your organization’s compliance and security settings, the SRA is an invaluable tool in securing the safety of your ePHI. 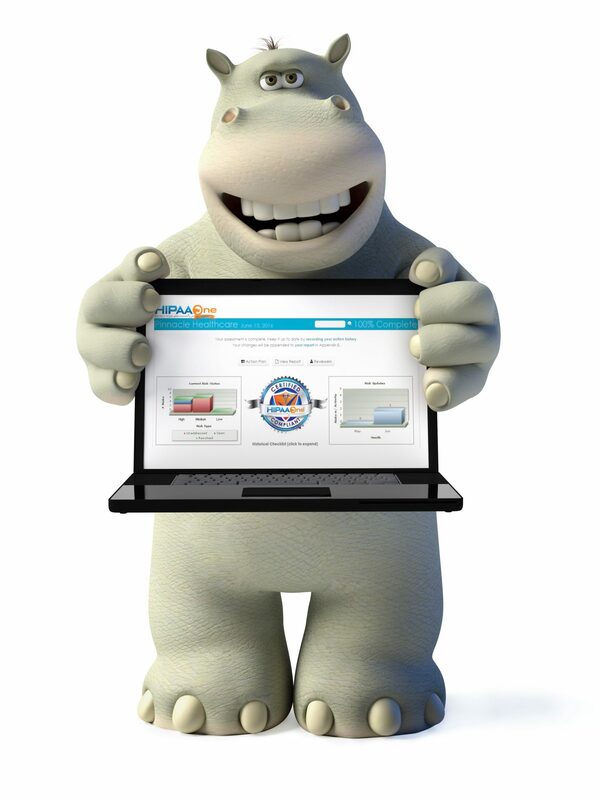 There are many SRA tools out in the marketplace today ranging from free spreadsheet templates to expensive consultants, at HIPAA One, we recommend utilizing our simple, automated and affordable software. Despite the fact that all data does not have PHI identifiers, (e.g. name, address, any other numerical or identifying information) it is paramount to identify where the data is located within your organization. This effort will involve working directly with the architects and programmers of your data system. A good place for your programmers to start is by reviewing any and all data mapping and data flow diagrams. To gain further insight into what’s already been completed in this area, a thorough review of existing data cryptography or sequence database schema will be conducted. Following data cyptography, a sensitive data analysis is performed – if using external consultants to augment IT staff, there should be no hands-on access needed as long as the data flow diagram and data mapping is available. It is also important to note that these mappings can also be performed through remote workshops. The work flow outlined above will result in a data inventory (e.g. email, name, home address and system data such as session ID’s, IP addresses, etc.). Side note, an analysis at this point should identify any EU-citizens needed for the new GDPR mandates. Any application mapping exercise should augment the data classification by determining why a user or application would need to see information that may or may not be required for the intended purpose. Sometimes applications will bypass database encryption and give a user excessive access to ePHI that is not necessary, opening the chances for unauthorized-access breaches. Disclaimer: We understand that turning on global encryption to databases can be unacceptable – and we do not recommend doing this. As a best practice, only encrypt data inside specific tables and employ best-practices for key generation, management and entry. For example, at deployment, a password is used for decryption of the master encryption key. The master encryption key is provided on a one-time basis by a singular person (or portions of the password shared between people) who knows the password. The master password should also be stored in RAM strictly for performance and security purposes. From an electronic media standpoint (e.g. laptops, desktops, thumb drives, smartphones, tablets, etc. ), encryption of the entire hard-drive or volume is recommended. Most SSD drives (high-speed hard drives) and computer hardware come equipped with processors to handle the overhead of encryption/decryption as needed on these devices. We specialize in HIPAA Security Risk Analysis and data security projects. If your organization has not yet completed an SRA for this calendar year, Contact Us to get started today. If you’ve heard the terms gap assessment and risk analysis used interchangeably before in privacy or security conversations, you are not alone. At HIPAA One, we have found that there are quite a few misconceptions about these two approaches and how to differentiate between them. So much so that we addressed the topic on a recent webinar with our trusted partners and advisers, Crowe Horwath. Click here for a link to the recorded version. In this post, we’ll define the key characteristics of a gap assessment and risk analysis and debunk a few myths along the way. As the more well known of the two, a HIPAA security risk analysis is a comprehensive assessment of all risks to ePHI (Electronic Protected Health Information) as required by HIPAA for healthcare providers and their business associates. By calculating risk based on threat, vulnerability, likelihood and impact, providers can gauge their compliance with HIPAA’s required administrative, physician and technical safeguards. A risk analysis assesses how ePHI is created, received, maintained and stored within an organization. Every bona fide HIPAA risk analysis will produce a remediation plan which creates a road map for “fixing” any security vulnerabilities as found by the risk analysis. For additional information and guidance on HIPAA risk analyses, visit The U.S. Department of Health & Human Services Office for Civil Rights (OCR) website. A gap assessment (also commonly called a HIPAA Compliance Program Review or Audit) is a method of assessing the differences in performance between an organization’s information systems or software applications to determine if there are any existing vulnerabilities in their network security settings. This high-level review of an organization’s controls can be completed using various controls and frameworks based on the target objectives of the gap assessment. Essentially a gap assessment compares what safeguards an organization has in place vs the reality of how well those safeguards are working. 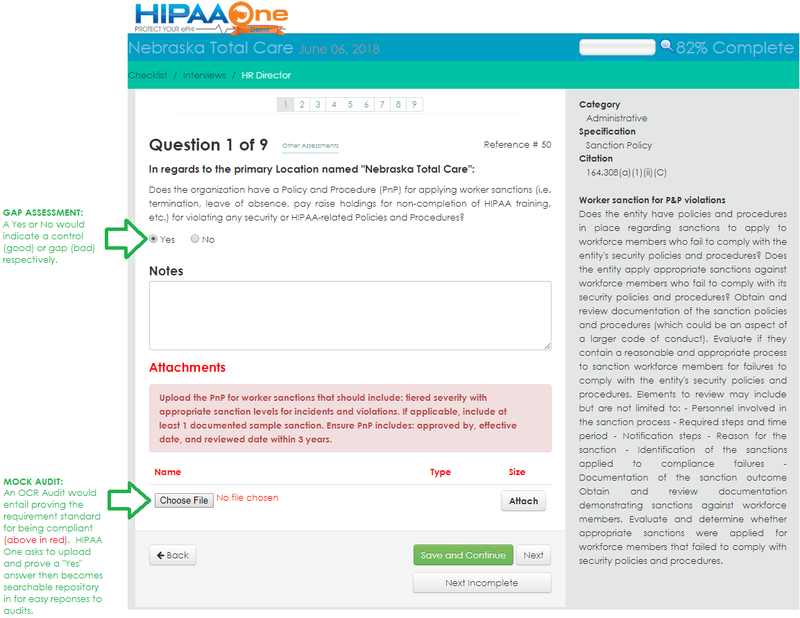 While a gap assessment is without question an effective tool at locating vulnerabilities, OCR clearly states that that a gap assessment is never a substitute for a bona fide risk analysis as required by the HIPAA Security Rule. Think of a gap assessment as an introduction, not a replacement to a risk analysis. When facing the decision of whether your workplace should focus on a risk analysis or gap assessment, our recommendation is always to comply with HIPAA first and tackle your HIPAA risk analysis. 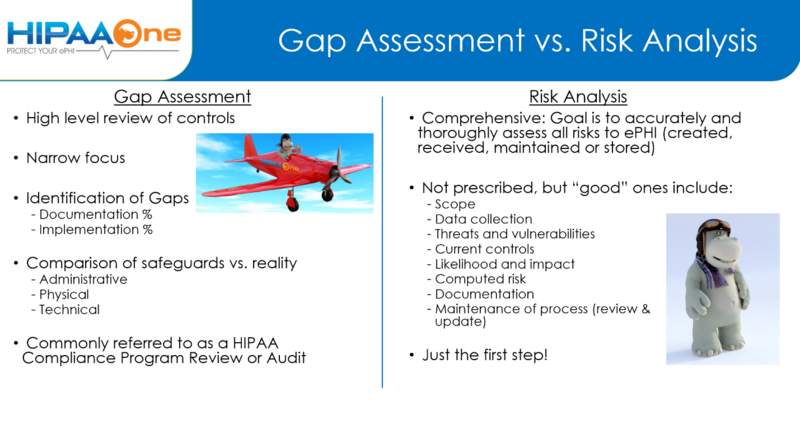 Then, once your risk analysis has been completed and remediation has begun, HIPAA One presents the gap assessment in the final report (below). Bottom line, never put your organization at risk by not complying with HIPAA or completing a risk analysis. At HIPAA One, we offer industry-leading, automated HIPAA risk analysis software and professional services to help your organization “check the box” on this mandatory requirement and be audit-ready. Click here to learn more and speak with a member of the team to hear about new software feature, Automated Templates which measure compliance controls at a corporate level then validating and updated by the field office staff. A new acronym has begun popping up within the healthcare technology community and is slowly beginning to gain momentum in the way of media coverage and industry articles. If you’ve heard the term GDPR in the past few months and did not understand what it was referring to, know that you’re not alone. In fact, we conducted a recent webinar poll with over 300 registrants and found that 81% of providers did not know what GDPR was referring to, let alone its potential impact on the U.S. healthcare industry. The primary question we are asking ourselves at HIPAA One is how will this framework impact U.S. based healthcare providers? Here’s what we know, U.S. companies do not need to have business operations in one of the 28-member states of the EU to be impacted by GDPR. The new set of rules will require organizations around the world that hold data belonging to individuals who live in the EU to a high level of protection and must be able to account for where every bit of data is stored. The good news is a large majority of U.S. based healthcare providers will be relatively safe in terms of complying with GDPR. If your organization is not actively marketing your services in the EU or practicing in the EU, a data breach where an EU citizen’s PHI is compromised would most likely be your most realistic brush with GDPR. For instance, a walk-clinic in New York City seeing many international tourists has a much higher chance of being impacted than say a rural clinic treating mostly local residents. Providers in larger cities with more diverse patient groups will need to be extra vigilant regarding their breach notification standards and security posture. An important concept for healthcare entities to grasp when thinking about GDPR is controllers vs processors which can be defined similar to the way we view covered entities and business associates. A processor (business associate) processes data on behalf of a data controller (covered entity) and is required to protect the data just as a controller would. Much like the HIPAA regulations, GDPR requires controllers/data processes to ensure a level of security appropriate to the risk by implementing technical and organizational measures to mitigate the risk. One way that controllers or processors can demonstrate such compliance is adopting existing leading practices such as COBIT, ITIL, NIST or ISO standards. With still many unknowns about the true implications of GDPR on the American provider, there are few ways your organization can prepare now to ensure a proper level of readiness. Conduct HIPAA Security and Privacy and Breach Notification Risk Analysis – The HIPAA One SRA and PRA software addresses most of the recommended GDPR controls and checks the box on an important mandatory HIPAA requirement. Double win! Review your current risk governance – An evaluation of your organization’s security posture is a great step in preparing for the growing international cybersecurity climate. Conduct a GDPR Assessment – Our internal research concludes GDPR encompasses approximately 60% of the same standards and regulations as OCR’s HIPAA Audit Protocol (e.g. performing a HIPAA Security Risk Analysis per 45 CFR §164.308(a)(1)(ii)(A)). A complete and comprehensive set of Policies and Procedures can be used to bridge the gap of the remaining 40% of standards covered by GDPR. 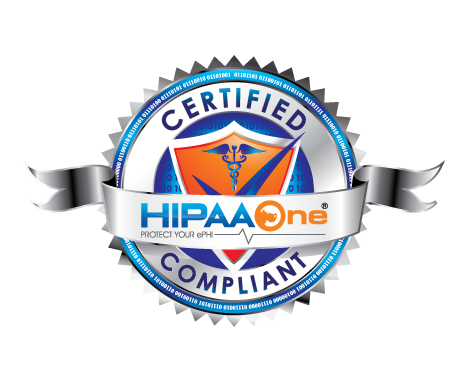 Just as we try to do with all cybersecurity and HIPAA related happenings in both the U.S. and aboard, the team at HIPAA One is committed to closely monitoring GDPR requirements and providing our readers with the most up-to-date information we have. As with all aspects of healthcare, sometimes it feels like the only constant is change. By getting your house in order now, your workplace will be well equipped to navigate any changes brought on by GDPR in the months and years to come. Learn more about how your practice can get started with a bona fide HIPAA risk analysis today. In our culture, something or someone is always trending. Whether it be bell-bottom jeans in the ’70’s, playing Nintendo in the ’80’s or watching stock market go up and down (whenever! ), trends are a lenses through which we see the world. Much like trends in fashion or entertainment, our workplaces showcase various trends as well and the healthcare information technology (HIT) community is no different. Currently, organizations migrating their data to cloud based systems is a trend which shows no signs of slowing down anytime soon. The migration of healthcare records from being placed “in the closet down the hall” to the cloud, is becoming commonplace for both single doc practices and large health plans alike. The cloud allows organizations of all sizes to compete effectively in the new digital era and stabilize costs. Is Your Cloud Provider Really Secure? Currently the marketplace is saturated in cloud service providers. Public providers like Amazon Web Services (AWS), Microsoft Azure or Google cloud, dominate the landscape and offer cloud services at very competitive prices. Despite their brand recognition and reputation, do we have any assurances AWS or Microsoft Azure are secure? Is the feeling of security with these companies real or a convenient illusion? The truth is these public providers are by-design very secure, however, they are also delicate and susceptible to common, simple and unintentional configuration errors that can lead to data leakage and/or data loss. Like safety belts in automobiles are statistically-proven to save lives, it is up to the driver and passengers to fasten before embarking on the next drive. Within the last two years, over 1.5 million private medical records have become publicly available through Amazon Web Services due to mis-configurations on the security settings of the latter. The exposed data, impacted organizations like Kansas’ State Self Insurance Fund, CSAC Excess Insurance Authority, and the Salt Lake County Database. The common misconception is only small organizations pay little regard on Cloud Security. However, recently two stories became publicly known regarding military data exposed on the Internet. The first included “dozens of terabytes” of social media posts identifying and profiling persons of interest for the U.S. Intelligence, while the other one, included a classified toolkit for potentially accessing U.S. military intelligence networks. Both examples were found on an open Amazon-hosted data silo, due to misconfigured access rights. A large number of other data leakage stories have also made headlines recently including major international players like Accenture, Verizon and Viacom. All of these stories have the same underlying theme, the affected companies where all placed in the awkward position of having to comment on misconfigured cloud accounts. These data breaches revealed that every cloud deployed solution is not bullet-proof and can only be as safe as their privileged users / administrators (the weakest link of this chain) allow them to be. In an attempt to address cases like the aforementioned misconfigurations, in the 4th quarter of 2017 Amazon announced new security features and safeguards. These new features, which include data encryption and user warnings when data is publicly accessible, are a step in the right direction. However, due to the fact that cloud services become more and more complex with new features added every day, no one can solely rely upon these new features to secure their cloud infrastructure. Due to the fact these cases were discovered on large public cloud providers, like AWS, Microsoft Azure and Google cloud, one can easily assume that any organization regardless of size is at risk. As IT professionals, we can only speculate about the cloud security vulnerabilities of private cloud environments as not many cases have been analyzed in the international literature. In private cloud systems, functionality is prioritized over security. Irrelevant but interdependent configurations are to be sorted out in limited amount of time, using different and possibly incompatible software vendors. These characteristics showcase just some of the potential misconfiguration threats for the confidentiality of your data in private cloud storages. It is important to remember that all the aforementioned risks, are placed on healthcare providers while they try to remain HIPAA compliant and does not take into any account the usual risks imposed for all online content. Negligent user activity or becoming a target of cyber-criminals remain a valid risk that requires urgent mitigation. Whether public or private, all cloud systems should be tested in order to identify vulnerabilities in an effort to become “cyber-proof.” Any exposure of sensitive data heavily impacts the image and reputation of healthcare providers. Cloud security testing is truly a necessity and should be implemented from the very first day your organization begins saving sensitive data on a cloud system. After weighing the cost of a data exposure, the value of investment in external IT security services absolutely increases. Test your cloud Applications against unauthorized usage. As a team at HIPAA One, we understand through first hand experience Platform-as-a-Service security concerns. Contact us today for a free application security consultation to find the most effective way to assure the risks of unauthorized access to your organization’s data are minimized. First, do your HIPAA Security Risk Analysis immediately to reduce chances of a breach while maintaining compliance with all Federal reimbursement programs. With just mere days left before the March 31st MIPS submission deadline, if you have not already pulled together the necessary documentation for the previous calendar year, it is the time to do so! 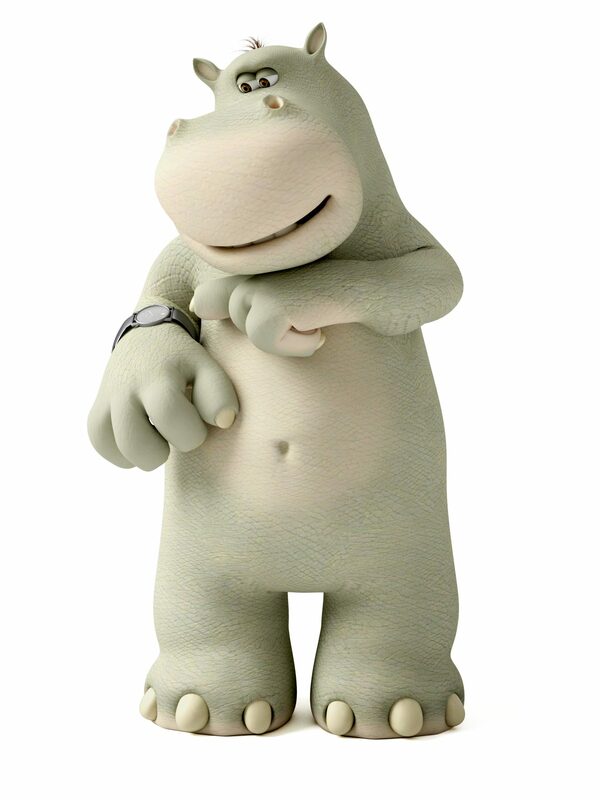 For all those last “minute’ers,” we have some guidance to assist in your efforts. One of the most important concepts to understand about the 2017 MIPS program is the grace that is being extended by CMS. In fact, 2017 is being considered a “transitional year” meaning providers do not need to have all three measurements in place to avoid penalties and gain incentives – GOOD NEWS! As a reminder, these measurements include: Quality Measures, Advancing Care Information (security risk analysis required) and Improvement Activities. Finally, there is no time like the present to complete a bona fide HIPAA Security Risk Analysis! Checking this box will immediately reduce your changes of a breach while maintaining compliance with all Federal reimbursement programs. Get started today! A recent HHS Office for Civil Rights email blast outlined a story that many of us have heard before, another business closed with significant monies paid out in fines. Filefax, Inc. has agreed to pay $100,000 in order to settle potential violations of the HIPAA Privacy Rule. Once a medical records storage company for covered entities, Filefax shut their doors during the OCR investigation yet could not escape additional fines and penalties that followed after their doors were closed. The bottom line, HIPAA violations do not stop just because a business closes. The consequences of HIPAA violations are significant and far reaching. Beyond the financial ramifications, organizations stand to lose their good standing reputation, client/patient trust and their ability to operate a business. It can take organizations months, even years to recover from penalties if they ever do, so why have so many of us read the headlines but not heeded the warnings? What Qualifies as a HIPAA Violation? A HIPAA violation occurs when either a covered entity (CE) or business associate (BA) fails to comply with one of more provisions of the HIPAA Security, Privacy or Breach Notification Rules. Violations may result for a number of reasons and may be deliberate or unintentional. Example of a Deliberate Violation – Inadequate Privacy training for clinical staff which results in a patient complaint regarding disclosing their full identity through a verbal announcement in a waiting area or hospital emergency room. 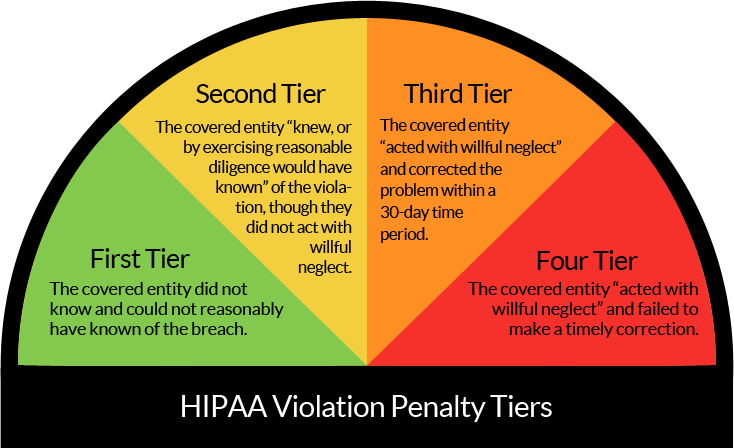 The penalties and/or fines administered by OCR are based on the severity of each HIPAA violation. Some HIPAA violations can be expensive and vary greatly in cost based on the level of negligence displayed. Contrary to what the headlines may lead you to believe, OCR will first strive to resolve violations using non-punitive measures such as issuing guidance to help the provider fix the areas without issuing a fine however that is not always possible. If a penalty is issued, it can range in cost from $100 to $50,000 per violation (or record) with a maximum penalty of $1.5 million per year of violations of an identical provision. OCR takes many different factors into account when determining what is the appropriate financial penalty and uses a four tiered approach as shown in the image below. A few of these factors include: number of patients affected, what specific data was exposed and for how long, etc. Along with the financial ramifications, HIPAA violations can also carry criminal charges that may result in jail time if warranted. Being that the stakes are high and much is on the line, how does a practice or organization protect themselves against HIPAA violations? Show due-diligence. The best task to start with is complete a comprehensive, organization wide HIPAA risk analysis to determine any gaps in compliance. Without a baseline knowledge about their security, privacy and breach-notification posture, both CE’s and BA’s operate day to day unaware of their security vulnerabilities which can directly lead to HIPAA violations and data breaches. Unsure where your organization stands? Take our short 5-minute HIPAA compliance quiz designed to quickly outline your organization’s basic level of compliance. Last May, we wrote a “How To” blog on the Social Security Limited Access Death Master File (LADMF) aka DMF and the response has been overwhelming! The HIPAA One team is delighted by how many of you have come forward and asked us to assist your organization in accessing this file. As the rest of the industry catches up and the need continues to grow, we want to revisit the content again. Being that this file contains critical information for healthcare providers, continue reading on to learn “how and why” HIPAA One can act as an Accredited Conformity Assessment Body (ACAB) for your organization. The DMF is essentially a database maintained by the Social Security Administration and contains over 86 million records on deceased individuals. Used to verify death, the online file has many purposes and is used by a variety of users, including: medical researchers, hospitals, oncology programs (tracking former patients and subjects), investigative firms (payment of pension funds), insurance organizations, etc. In November 2016, changes were made to the access requirements for individuals or organizations seeking to access the DMF. Due to the sensitive nature of the information coupled with an effort to prevent identify theft and fraud, individuals or entities must now submit a written attestation form an ACAB to prove that the appropriate systems, facilities and procedures are in place to safeguard information and maintain the confidentiality and security of that information. In order for a healthcare entity to prove they have the appropriate safeguards in place to access the DMF file, they must complete a Security Risk Analysis (SRA.) Along with a myriad of other benefits; an SRA accurately displays an organization’s safeguards and subsequent remediation plan to correct any deficiencies. By completing an SRA, healthcare organizations prove their commitment to properly securing sensitive information and building an overall “culture of compliance” at their workforce. As your HIPAA compliance vendor, we are happy to offer our services and act as your ACAB if you used our software to complete your SRA*. However; we are unable to assume that role for clients who conducted an SRA independently or without using our tools. 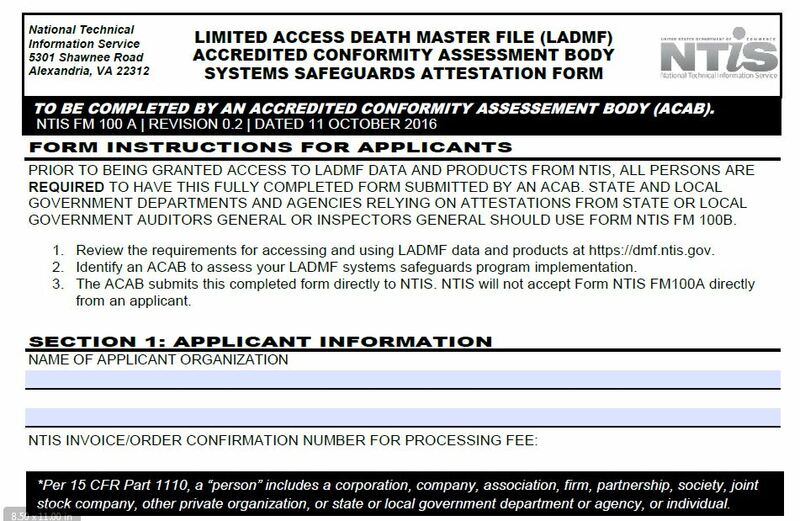 There is an annual fee for processing the LADMF Subscriber Certification Form, payment can be processed here: https://classic.ntis.gov/Search/Home/titleDetail?abbr=DMFCERT0002. Additionally, every three years a processing fee of $525.00 LADMF ACAB Systems Safeguards Attestation Form is required. After the payment has been accepted, complete and submit the LADMF Subscriber Certification Form at https://dmfcert.ntis.gov. Certification must be renewed each year. 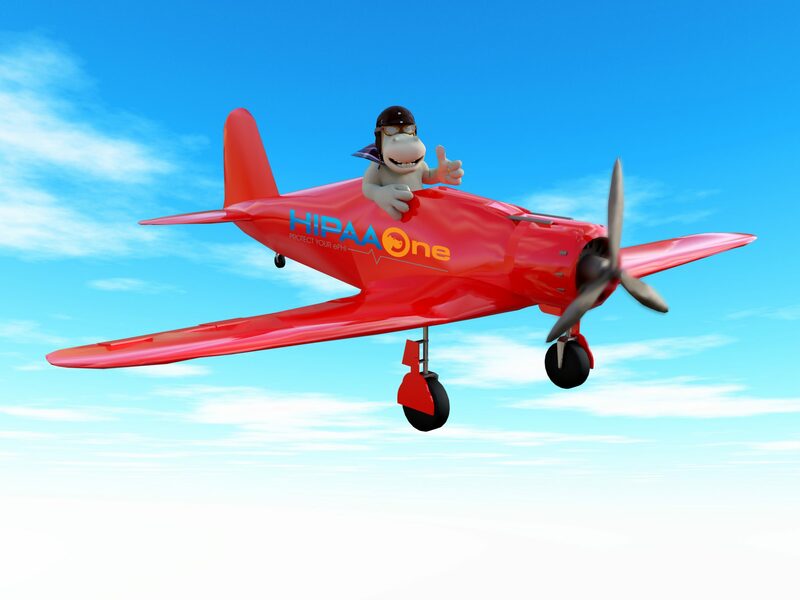 Contact us at info@hipaaone.com or call 801-770-1199 to speak with one of our experienced auditors. The concept of the “Internet of Things” (IoT) is becoming an increasingly growing topic of conversation as more and more companies are interconnecting everyday objects around us to the internet, such as: medical devices, appliances, voices and faces, HVAC systems, TVs, vehicles, money and health information. These devices are now enabled to record and exchange data about individuals’ behavior, habits and personal information through the Cloud. Microsoft Windows 10 Enterprise allows PC users to decide for themselves if they want their Personally Identifiable Information shared with the IoT, or not. In the healthcare industry where cybersecurity, privacy, and compliance can make or break an organization, Microsoft recognizes the importance of supporting these communities by designing our software and cloud services to be flexible, secure and to meet regulatory compliance mandates. As a core component to Microsoft’s ecosystem, properly configuring Windows 10 for Enterprise not only assists healthcare entities with HIPAA security and privacy compliance, but also introduces numerous security capabilities to help protect sensitive environments against dynamic and increasingly complex malicious cyberattacks, viruses and malware. Windows 10 Enterprise is highly-evolved with a built-in, deep-level security architecture balanced with industry-leading compatibility to drive improved user productivity. Threat, Identity, and Information protection risks are significantly reduced by simply by using Windows 10 (you can read about some of Windows 10’s latest enhancements here). Last year, we partnered with Microsoft and developed a third-party, detailed recommendation on how to configure Windows 10 in a manner that maintains the security of PHI in accordance to HIPAA. It is great excitement that we share the news that the latest version of the “HIPAA Compliance with Microsoft Windows 10” whitepaper including updates found in the most-recent Fall Creators Update is now available. Any of our customers pondering upgrading to Windows 10 will find assurance and value in the recommendations found in this whitepaper, and that the real-world tested configurations will serve as a complement to their security baselines. Does your workplace accept any payments from EHR incentive programs like MACRA or Meaningful Use? If so, the fourth quarter is probably a busy time preparing and finalizing documents for submission. At HIPAA One, we understand the amount of extra work that can add to a workforce. Therefore, we would like to provide a little assistance and guidance on the specific HIPAA security risk analysis requirement so there is not any delay in receiving those crucial payments. The Meaningful Use reporting deadline for this calendar year is December 31, 2017. To the best of our knowledge, an extension has not been granted – therefore all activities must be completed in the next 6 working days of the calendar year. As mentioned above, to qualify for Meaningful Use or MACRA (MIPS) dollars, an annual HIPAA security risk analysis is a requirement for every healthcare provider attesting. If your workplace was to be audited due to a patient complaint, random audit, etc; failure to have a current documented HIPAA risk analysis could result in a mandatory requirement to give back awarded Meaningful Use dollars. In order to attest for Meaningful Use, your risk analysis needs to be completed in the same calendar year for which you at attesting. The Final Rule for MU Stage 3 states the following regarding protection of health information: “The measure must be completed in the same calendar year as the EHR reporting period. If the EHR reporting period is 90 days, it must be completed in the same calendar year. This may occur either before or during the EHR reporting period; or, if it occurs after the EHR reporting period, it must occur before the provider attests or before the end of the calendar year, whichever date comes first.” To learn more about the necessary supporting documentation for audits, click here. If this post has increased your heart rate a little or given you reason to worry about the upcoming December 31st deadline, don’t fret! There is still time to complete a bona fide HIPAA security risk analysis using our automated, self-guided software. Our sales team members would love to answer your questions. Get started now.